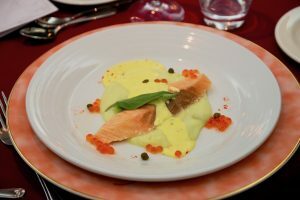 Today is our onboard party and formal dinner. 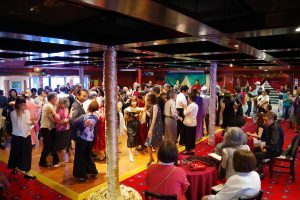 Each part of the ship is colorfully decorated which has created an elegant atmosphere. Two months have passed since the voyage started. Even though we try to cherish each day of this trip, we have become used to passing the days casually. Today is a special party and dinner for us to dress up and have some fun. 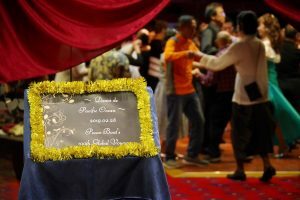 “Dance de Pacific Ocean” was held in the free space area on the 8th floor, and the venue seemed to turn into a dance hall immediately. 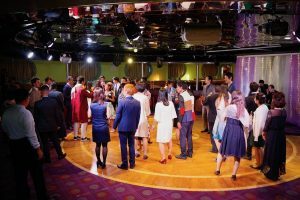 After receiving a brief party dance lesson from Atsuko Minami, a social dance instructor from Culture School, everyone begins to dance in step to the live performance of the onboard band. The medley of theme songs from nostalgic films feel familiar and create the perfect setting to enjoy the elegant atmosphere. After dancing, everyone is eager to go to dinner. The beautiful dresses and suit jackets make the restaurant on the 4th floor even more colorful. After dinner, everyone returns to the 8th floor. The Starlight Lounge bar is set up for everyone to enjoy a drink. Everyone is dancing, talking, and having a good time in this wonderful atmosphere with the music floating through the air. One of the participants said, “I knew some peoples faces, but tonight I was able to speak with some of them for the first time. 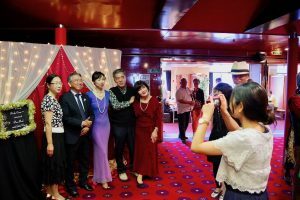 Some of those people are traveling for different reasons or have different values than myself, more than anything I was very happy to meet new people.” It was a wonderful party and dinner that made us even more excited for the last month of our journey.